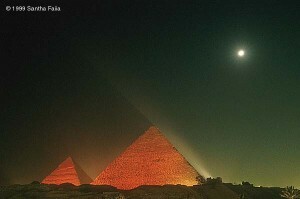 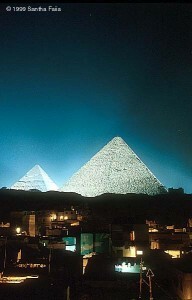 The Great Pyramid of Khufu at Giza. Perhaps it was constructed on such a massive scale to survive both the ravages of time and of destructive ignorance. The Pyramids and the Great Sphinx of Giza. 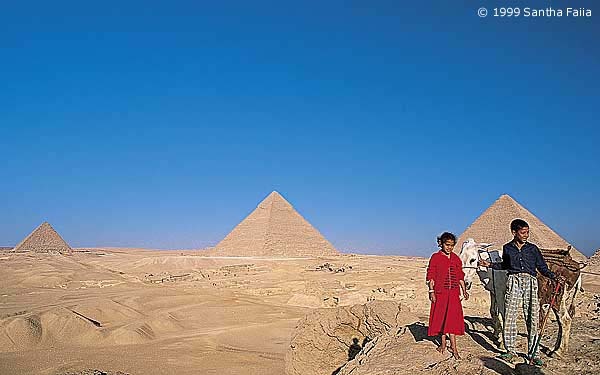 The Sphinx faces perfectly due east. 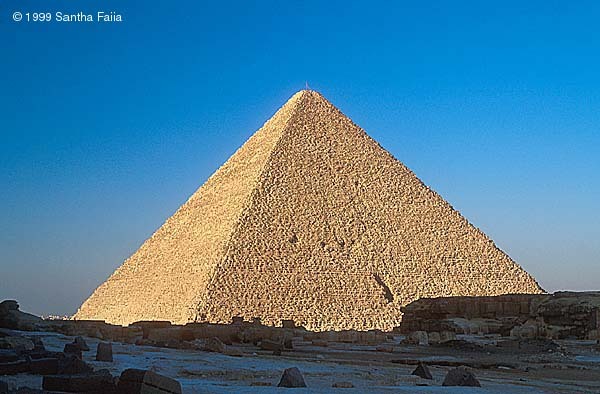 The pyramids are oriented precisely, with each face aligned to a cardinal direction. Giza by night: Futuristic lighting effects combine with Millennia old architecture to create a truly awe-inspiring vision. 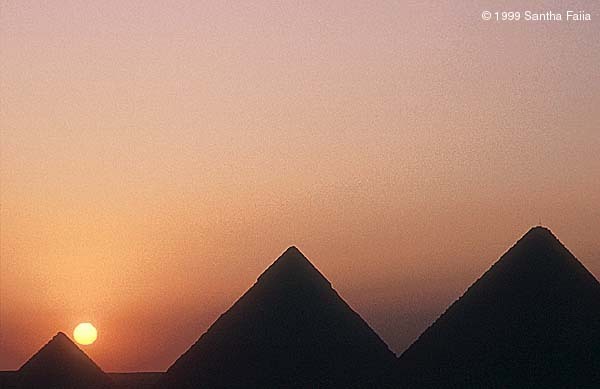 The three great Pyramids of Giza, viewed from the south-east. 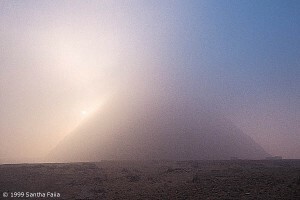 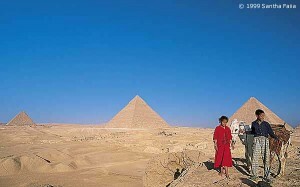 To the right, the Great Pyramid of Khufu, centre the Pyramid of Khafra, left the smaller Pyramid of Menkaura. 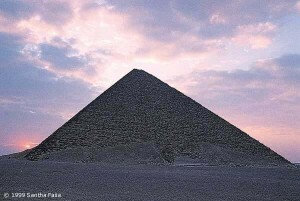 Pyramid at Giza. Seeming to rise out of the morning mist as a potent image of the Benben stone - said to have fallen from heaven. 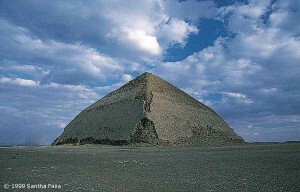 The 'Bent' Pyramid at Dashur, supposedly built by Sneferu (2575-2551 BC) the father of Khufu, the traditional builder of the Great Pyramid. The 'Red' Pyramid at Dashur, like the 'Bent' Pyramid also said to have been built by Sneferu. 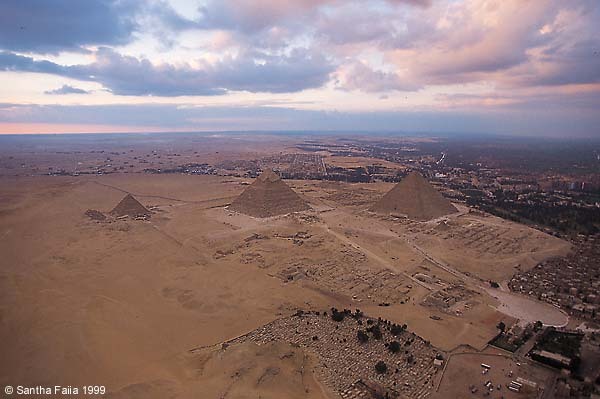 Modern day Giza sprawls at the feet of these ancient giants.